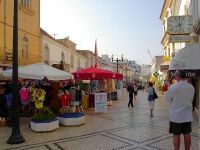 Albufeira having developed from once a small fishing village into undoubtedly the most famous of destinations along the Algarve. Narrow streets of whitewashed buildings with plenty of restaurants, bars and nightlife, together with an excellent beach, make Albufeira an ideal choice for that HOLIDAY HOME. Click here for details of properties in and round Abufeira.